PITTSBURGH (AP) — Don’t get Josh Dobbs wrong. 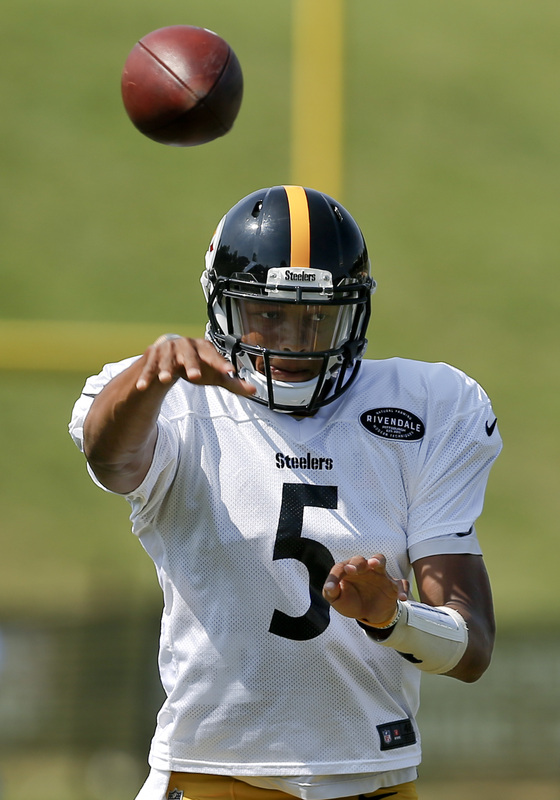 The Pittsburgh Steelers’ rookie quarterback is amped to take the first snaps of his NFL career on Friday night when the AFC North champions open the preseason against the New York Giants. The fourth-round pick from Tennessee — who may or may not be Ben Roethlisberger’s eventual replacement depending on whom you ask — wants to get in the huddle with the starters. He wants to hear the roar of the crowd and the sound of offensive coordinator Todd Haley’s voice crackling in his headset. He wants to stand at the line of scrimmage, scan the defense, put the puzzle together and go. Of course there will be pressure to show the Steelers they made the right decision when they took him with the 135th overall pick, the same exact spot the Dallas Cowboys took Dak Prescott last spring. But Dobbs is well aware pressure is relative, one of the byproducts of earning a degree in aerospace engineering. Trying to read a defense and put the ball in the right place is one thing. Trying to figure out how to safely get people — be they pilots or passengers — from one place to another safely is another, one with considerably more significant consequences than an incomplete pass. “You have a lot of lives at stake with every problem that you do,” Dobbs said. So while Dobbs fully expects a range of emotions when he sprints onto the field with his No. 5 game jersey pulled tight, fear of failure won’t be one of them. It’s simply not part of his considerable vocabulary. “I’m just anxious to compete,” Dobbs said. And Steelers coach Mike Tomlin is anxious to see if Dobbs’ poise and precision during the opening weeks of camp translate when it (almost) really matters. “At that position, you’re defined by how you perform under certain circumstances,” Tomlin said. “And it’ll be good to get him in that stadium on Friday night and watch him in terms of putting his skills on display. This is just the first time out. Dobbs won’t lack for opportunities. Roethlisberger is getting the night off and primary backup Landry Jones will sit while battling an abdominal injury. With Bart Houston the only other active quarterback on the roster, Dobbs should play the entire first half and perhaps well into the second in what marks as the beginning of extended audition to take over whenever the 35-year-old Roethlisberger — who weighed retirement over the winter before deciding to return for a 14th season — decides to walk away. Not that Dobbs is ready to look that far down the road. He can’t predict his own future let alone Roethlisberger’s. So he’ll just continue to bury himself in Haley’s playbook and try to be ready when and if the time comes, if it does at all. Dobbs made his debut at Tennessee as a true freshman in 2013 against Alabama, pressed into action when Justin Worley went down with a thumb injury. He managed just two touchdown passes in five games that year. More growing pains followed in 2014 before he took off as a junior. He set a school record for rushing touchdowns by a quarterback in a single season (12). The Steelers aren’t as interested in Dobbs’ legs so much as his right arm and his voracious appetite to learn. Now comes the fun part: seeing how quickly he can translate all that knowledge into performance. He looked pretty comfortable running a two-minute drill with the starters on Wednesday, throwing a touchdown as the clock ticked toward zero. “He doesn’t second-guess what he’s doing,” said rookie wide receiver JuJu Smith-Schuster, who has quickly developed a bond with Dobbs. That comes later in the film room where Dobbs will grade himself out. And there is no Bell curve. There can’t be. When in the huddle, his job is the same as Roethlisberger’s. It’s heady territory, but one Dobbs believes he can navigate.